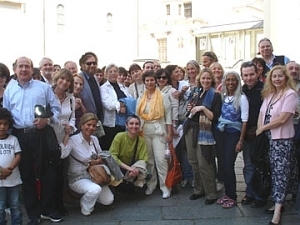 In May of 2010, Drs J.J. and Desiree Hurtak had the opportunity with members of The Academy For Future Science, in Italy to visit the Cattedrale di San Giovanni Battista, Turino (The Cathedral of John the Baptist, in Turin). 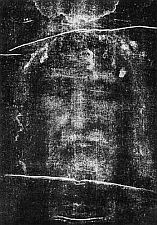 The Sacred Relic of the Shroud of Turin, believed by many to be the cloth that covered the body of Jesus while in the tomb of Joseph of Arimathea, was on display. This viewing only takes place at irregular intervals decided by the Catholic Church and only 8 times in the past 100 years. The history of the Shroud is somewhat sketchy before the 14th century, at which time it was found in Troyes, a city southeast of Paris, and before that was in the hands of the Knights Templar to protect it after the sacking of Constantinople during the Fourth Crusade in 1204. (See Chronicle of the Shroud). Although the Catholic Church now officially owns the Relic, they have not made a clear confirmation that this was the actual burial cloth of Jesus. For many reasons, they have been hesitant. Not the least occurred in 1988 when they allowed scientists to take a sample of the rim of the cloth for carbon dating. The sample was cut into fragments and sent to three major laboratories–in Tucson, Arizona; Oxford, England; and Zurich, Switzerland. The results from these three laboratories varied on the exact date, but all agreed it was most likely a fourteenth century. People where stunned, how could this be? The carbon dating seemed to put an end to “the believers” hopes. However, not everyone accepted the findings of the carbon dating. Two amateur investigators Sue Benford and Joe Marino were amongst those who refused to accept it. In their search to disprove the carbon dating, they noticed that the samples given to the laboratories were mostly made of “cotton fibers”, whereas the main herringbone weave of the Shroud was made of flax linen fibers. Their findings were highlighted in a major American documentary. They were supported also by two main members of the STURP (Shroud of Turin Research Project) team: photographic expertise of Barrie Schwortz and Los Alamos National Lab chemist, Dr. Raymond Rogers, who also recanted the carbon dating based on their findings. It seems that the samples given to the laboratories were from a repaired area of the cloth and not part of the original cloth and hence the false carbon data. 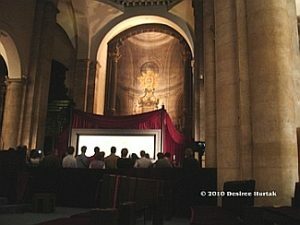 Just as exciting is the recent announcement that there are also faint words on the Shroud of Turin that have now been clearly amplified by optical and computer systems. This is the work of Barbara Frale, a Vatican researcher. The amplified “words” on the Shroud spell out a sequence of events suggesting that they are part of a “death certificate” laid on top of the Shroud by authorities in Latin, Greek and Hebrew letters. These “invisible letters” that are now “visible” through modern technology were transposed into the Shroud surface. The new linguistic findings of what looks like the “aleph” Hebrew letter on the throat of the “Christ image” on the Shroud is similar with the “aleph” published in The Book of Knowledge: The Keys of Enoch® in 1973 which is illustrated in Plate XII called the “Adam Kadmon” in exactly the same position! It was the epiphany of seeing “light pouring out of the throat and mouth” of Jesus with the “aleph” sign on the throat that led this author to commission a very well known artist to make a complex illustration of Jesus as the Adam Kadmon (archetypal man) with the crown of “Divine Names” upon his head and illustrating the “beginning” of the next stage of life–in the sign of the “aleph”! Renewed interest by a new generation of researchers is a welcomed sign of the closer cooperation between science and religion on the “Christ story” beneath the history and veneer of Western civilization.